Use Growing Up WILD’s “Grow As We Go” to explore the life cycle of frogs. Use the life cycle cards in the back of the book or share photographs of the frog life cycle from books or the internet. 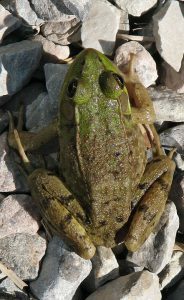 Discuss frogs as a class: Ask children if they have ever seen a frog? A tadpole? How does a tadpole change to become a frog? Explore these questions as a class. If possible obtain tadpoles in the spring and observe them as they grow and change (be sure to follow your state and local regulations on possession of wildlife).